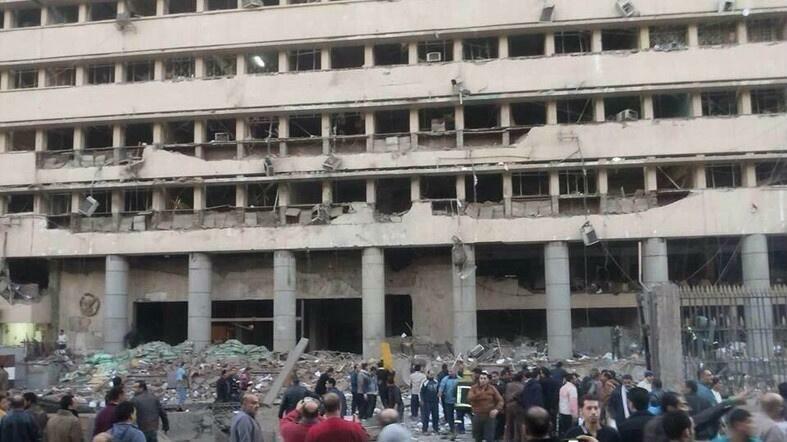 A suicide bomb at the Cairo Security Directorate on Friday morning killed at least four people and injured 76. Security sources said three of the dead were police officers. A second bomb killed one person near a metro station in the Dokki section of Cairo. An ambulance driver said seven people have been injured. UPDATE: A third bomb goes off near Al Talibiyah police station in Cairo, gun fire heard. #Egypt"
Late Friday afternoon, a fourth bomb exploded near a cinema in Giza, killing at least one person. The explosion in the parking lot of the Security Directorate, in the Bab El-Khalk district, smashed the building’s windows and ripped off parts of its facade. Crowds outside the security directorate calling for death of Brotherhood, one man said "we'll take their daughters,wives&return them naked"
An Interior Ministry spokesman said initial investigations showed that a car bomb might have been used. The attacks come one day before the third anniversary of the rising that overthrew President Hosni Mubarak.